A company called Eastern Safaris has launched a new hot air balloon experience that will give passengers a unique view of Chile’s Atacama Desert, regarded as earth’s driest non-polar location. On Aug. 12, the company began offering daily flights in what it calls Balloons over Atacama in the heart of Chile’s northern desert. Flights will send passengers floating high above one of the earth’s most ancient landscapes, creating an interesting juxtaposition: viewing one of nature’s magnificent creations while riding aboard one of man’s earliest flying conveyances. Balloons over Atacama will offer passengers stunning views of Chile’s spectacular Atacama Desert, ancient rock formations and salt plains viewed against a backdrop of distant volcanoes. Passengers will also be able to see the Valle de la Luna, or Valley of the Moon, with its numerous rock formations. The company has nearly two decades of experience offering balloon flights. Eastern Safaris has also produced Balloons over Bagan, a series of flights that transported guests above Myanmar’s spiritual heartland where they were able to glimpse thousands of ancient temples, and Balloons over Inle, where passengers flew over Myanmar’s Inle Lake and the agricultural lands, villages and mountains that surround it. According to its website, the company has taken great pains to offer guests the safest balloon experience possible while simultaneously operating in a manner that is environmentally friendly. 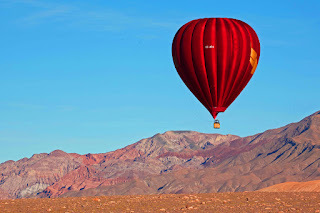 Balloons over Atacama is fully licensed and approved by the Department of Civil Aviation of Chile to operate commercial passenger balloon rides. Guests can select from two levels of service: Classic and Premium. The Classic Service will welcome 16 passengers per flight, divided into compartments of four. Passengers will take off at sunrise and be treated to coffee and tea, fruit and freshly baked pastries. After landing, they will be offered the opportunity to indulge in a celebratory glass (or two) of champagne. The flight itself, pre- and post-flight refreshments and transportation between travelers’ accommodations and the launch/landing sites is also included at prices beginning at US$300 per person. The Premium Service offers a more exclusive and intimate experience. In addition to everything offered in the Classic Service, Premium passengers enjoy the additional luxury of only eight passengers per balloon, divided into compartments of two. Prior to takeoff, Premium passengers will participate in an interactive tour of the balloon during inflation, followed by the sunrise flight, where they will receive a complimentary inflight photo. The Premium Service will cater to couples and small groups of up to eight. Pricing begins at $375 per person. Reservations for both Classic and Premium service can be made by emailing res@alicantoballoons.com.